The British agnostic philosopher Bertrand Russell said he could not believe in Satan because the very notion of a devil was not even probable, and therefore not worth consideration. One has to wonder whether by this reasoning, if Einstein had regarded relativity as improbable (which it certainly was) rather than possible, relativity would ever have been discovered because it was not worth considering. Nor does Russell consider why it is that among all of humankind there is a perpetual whispering in the ear that we may profit handsomely by doing evil rather than good. Who does the seductive whispering if not a possible Satan? And if Satan is possible, why is he not worth considering? Why and how did Satan come to exist as rebel against God and tempter of all? Who tempted Satan if he is the ultimate Tempter? We cannot know the details of that story, but can only surmise that surely it had something to do with supremely malevolent pride, the same pride that elevates Satan’s dark throne and strives to drag legions of us down into hell with him. Even the usually profound Dostoevsky seemed baffled when he had Father Zossima in The Brothers Karamozov opine: “Of the pride of Satan what I think is this: it is hard for us on earth to comprehend it, and therefore it is so easy to fall into error and to share it, even imagining that we are doing something grand and fine.” Doubtless Satan believes he has accomplished something grand and fine; he exults in building an empire of his own over which he rules undisputed; there is no clear evidence found that he is shamed by his own shenanigans. The Christian doctrine of hell and the existence of devils is one that some people don’t like to talk about. “Nonsense, I don’t believe it. The hell, you say!” might be the reaction of those who like to think that Satan prodding us with pitchfork amidst our own hellfire is just plain medieval superstition and fearmongering. Those theological liberals who tend to mock or minimize the idea of damnation cannot get around the fact that, in the Gospels, Jesus often enough mentions hell and even encounters demons and overcomes them on several occasions. Satan is mentioned by name thirty times in the New Testament. Very likely he would have preferred not to be mentioned at all, since, as Bishop Fulton Sheen used to say, those who do not believe in him are already on his side. Pope Paul VI in 1972 is reported to have said, “The smoke of Satan has entered the temple of God through some crack: doubt, uncertainty, dissension, worry, discontent, and conflict are plain to see.…” So we know that even the Vatican is not exempt from Satan’s grand design. Yet Jesus is not only merciful, he is just; and his justice is that he gives us fair warning that smiling devils eagerly wait to greet us on the other side. Smiling devils, yes. Who has not seen that television commercial where the young woman is sitting at a computer screen and hacking someone’s computer for the purpose of stealing that person’s identity credentials? Have you noticed the satanic grin on her face as she logs into a website to buy something with another person’s credit card? Do you see her as predator and the person who owns the credit card as prey? That is how we might think about the grin on Satan’s face every time he buys our soul with the lie that sin is good for us. He smiles at his purchase, as no doubt the Serpent in the Garden supremely bared his grinning fangs when Adam and Eve thought they had purchased Divinity with a bite of tasty fruit. So it is good for us to think of ourselves as potential victims of the devil. Indeed, in the Catholic prayer called the Act of Contrition, we are told to be sorry for our sins for two very good reasons: the fear of hell, and the fear of offending the God we are supposed to love with all our heart and soul. We are told that the more perfect fear is the second one, but a reasonable case could be made that you get to the second fear by going through the first one, which is the fear of being duped because we think we are smarter than we are, (which the devil surely wants us to think). Jesus knew how to put great wisdom in a few words; he rightly described Satan as a liar and a murderer in the Gospel of John 8:44. Satan lied to our first parents and brought death into the world. For that we have every reason to fear Satan above any other created being. And, as with any other enemy, we can only defeat him by knowing his methods. What exactly are his methods? The Anglican author C.S. Lewis cleverly described his methods in his little book titled The Screwtape Letters, a volume of letters from an imaginary senior devil named Screwtape to his nephew named Wormwood. The aim of the letters is to teach Wormwood how to help increase the empire of hell by cleverly deceiving humans he had been assigned to tempt; that is, by making them believe that bad is good, and good is bad. Not to be outdone, the Catholic philosopher Peter Kreeft, thinking like Lewis on steroids, has written a sequel titled The Snakebite Letters. This is not the place to discuss the devil’s clever strategies in all those fascinating letters, but rather to point out that satanic strategies must exist, that Lewis and Kreeft seem to have gotten a handle on some of them, and that they are worth studying. The sins of omission are terrible indeed, but how did we not know this without being told? We did not know it because we did not care to know it; more precisely, we preferred not to know it because caring would confer an obligation upon us that we can barely tolerate. That comes back to the devil being a liar. He not only tempts us with not caring about others, but, like the liar he is, he has us telling ourselves that caring about others is a whole lot less important than stabbing our neighbor in the back or sleeping with his wife. So there you have it; lying to others is a great sin; the greater sin might be lying to ourselves. When we start down that path, a slow walk turns into a fast run. Before we know it, we are telling ourselves the supreme lie, which is that God does not exist. More conveniently for Satan, we are telling ourselves the lie that if God does not exist, neither does the devil. And so, like the confused dogs that we really are, Satan throws us off his scent and we are all the more vulnerable to his wiles. I just used the phrase “the scent of Satan.” It may or may not surprise anyone to learn that when humans are possessed by the devil and in need of exorcism, it will often be found by the exorcist that the demon occupying the possessed gives off a foul scent. And so it is that we hear it said in Luke 9: “As he was coming forward, the demon threw him to the ground in a convulsion; but Jesus rebuked the unclean spirit, healed the boy, and returned him to his father.” If you do not take a bath for several days, you are unclean, and you smell ripe. So it is reasonable to expect that the presence of unclean demons is detectable by the exorcist just by their smell. This matter of exorcism is very ancient and universal. Most of the major religions, including Christianity, Judaism, Islam, Buddhism, Hinduism, and Taoism agree to the existence of demons and the need to exorcise them. Even secular modern science pays tribute to exorcism as a metaphor when the psychoanalyst is petitioned to rout our inner demons by first identifying them and then finding ways to make them go away (hypnosis, medication, surgery, etc.). Let’s look again at just one of the devil’s dilemmas as the exorcist approaches him. The stench of his unclean spirit tends to give him away. On the one hand, he needs to conceal his identity that he may succeed at his work in darkness; on the other hand, he is so full of himself his ego cannot resist showing off how formidable and conquering a foe he has become. Consider a book by psychiatrist Scott Peck, author of The People of the Lie (1983). Peck in this book describes an exorcism he was invited to attend. At first he was skeptical of the whole business, but by the end of the exorcism ritual he was convinced that devils exist and that they exhibit the most horrible demeanor when you are in their presence. Listen to his description of the scene he witnessed. “When the demon finally spoke clearly, an expression appeared on the patient’s face that could be described only as Satanic. It was an incredibly contemptuous grin of utter hostile malevolence. I have spent many hours before a mirror trying to imitate it without the slightest success…. The patient suddenly resembled a writhing snake of great strength, viciously attempting to bite team members. More frightening than the writhing body, however, was the face. The eyes were hooded with lazy reptilian torpor – except when the reptile darted out in attack, at which moment the eyes would open wide with blazing hatred… what upset me most was the extraordinary sense of fifty-million year-old heaviness I received from this serpentine being.” So, given this description of an exorcism, how appropriate it seems that Satan in the Garden of Eden should have been represented as a Serpent. However seductive and smiling he was with Adam and Eve, the serpent ever since has become to all the smiling embodiment of monstrous evil. The devil’s dilemmas are many. He desires to conquer, but has already been conquered; first, when he was trounced and cast down from heaven by the archangel Michael; and then more triumphantly defeated by Jesus’s agony on the cross. Even Adam and Eve, the founders of all our undoing, have been rescued from hell, and thus Satan has been royally foiled in his first conquest. How much the more enraged Satan must be with lesser mortals slipping through his grasp? But it can be done, and that too is the devil’s dilemma, because his passion for increasing the empire of hell can be so continually frustrated. Father Gabriele Amorth, the Vatican’s one time exorcist-in-chief who founded the International Association of Exorcists, applauded Pope Benedict’s instruction to all the bishops that specially trained exorcists should be available in every diocese. According to Father Amorth, “Too many bishops are not taking this seriously and are not delegating their priests in the fight against the Devil. You have to hunt high and low for a properly trained exorcist.” Fr. 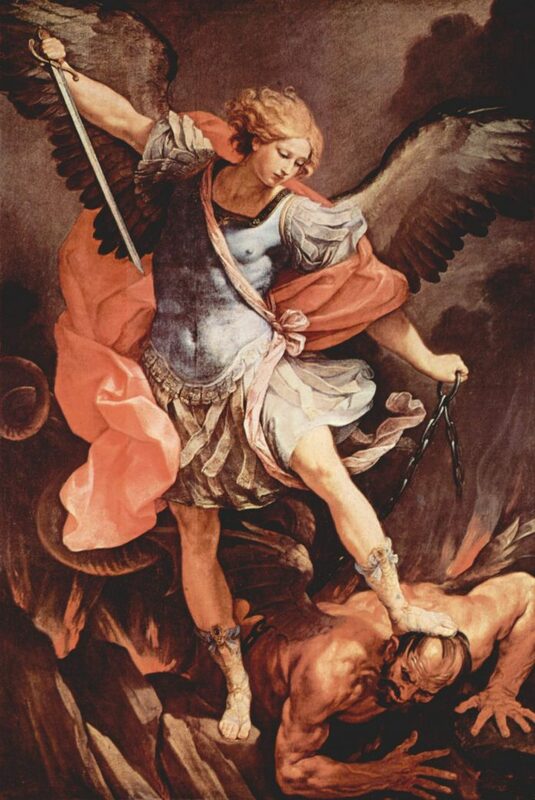 Amorth said Benedict wanted to restore the prayer to St. Michael the Archangel that used to be prayed at the end of each Mass until the practice ended during the papacy of John XXIII. As Rev. Thomas Rosica has pointed out, Pope Francis is also out to the beat the devil. For Francis the devil is unrelenting since he knows his opportunities are limited by the inevitable advent of the Last Judgment. But this knowledge does not deter Satan, and he is confident of success because, as Francis puts it, “The devil is intelligent, he knows more theology than all the theologians together.” And apparently the devil, who likes to sow discord among theologians, has bamboozled some of them into thinking of Satan as a misty metaphor rather than as a spiritual fire-breathing dragon from hell. In reality, Francis says, the devil often appears as an angel (pedophiles in Roman collars, for example?) and that is when we must be most on guard against demonic treachery. Francis has also recommended that priests who detect the presence of demons among those in the confessional should not be afraid to investigate whether demonic possession has occurred and an exorcism is needed. Such investigation of course requires discernment as to the difference between mental illness and actual possession. But the need for qualified exorcists he believes has increased with the increase in Satan worship and the decline of faith throughout the world. In one homily Francis remarked that the good angels are constantly battling the demons over the future of the human race. Every bishop can join the battle by having a well-trained exorcist available to beat the devil. How then do we personally beat the devil? Those who give themselves over to evil have made a poor deal. They have a low opinion of their worth. A good person knows his or her own worth. As St. Augustine said, though as a class of creatures angels rank above humans, even so, good humans are of greater value than bad angels. Realizing our value, proven by the pity Jesus had for us when nailed to the cross, sanity and self-respect requires that we think rightly on our own behalf. Fools say in their heart there is no God (Psalms 14:1); they have fooled themselves. Other fools say there is no heaven to seek and no hell we should daily and hourly strive to escape. Yet we do not escape the depths of hell and climb to heaven on our own. The ladder to heaven’s gate is the empowering grace of God. Jesus gave us that grace when he taught us how to pray. If every time we hear the whisper of Satan, we could just answer with that one sentence, “Lead us not into temptation, but deliver us from evil,” how could we not beat the devil?